Brined Thanksgiving Turkey - O-M-G! Best turkey ever! This turkey was so tender, juicy and flavorful! I could not get enough of this turkey! I was shocked. The brining was so simple, It only takes a few minutes to make the brine. Do you brine your turkey? We did for the first time at Christmas last year and we will be doing it every time we make a turkey now! I have never been a turkey fan. I think it lacks flavor and is dry. I usually have leftover lasagna for Thanksgiving and Christmas dinner! I was reading an article about brining, and I decided to give it a try. O-M-G! Best turkey ever! Everyone agreed! This turkey was so tender, juicy and flavorful! I could not get enough of this turkey! I was shocked. The brining was so simple. It only takes a few minutes to make the brine and then the turkey just hangs out in the fridge until you are ready to start roasting. We let the turkey brine for about 16 hours. The cooking time will depend on how big your turkey is. A good rule of thumb is about 15 minutes per pound at 350 degrees. The best way to tell if the turkey is done is to use a meat thermometer. 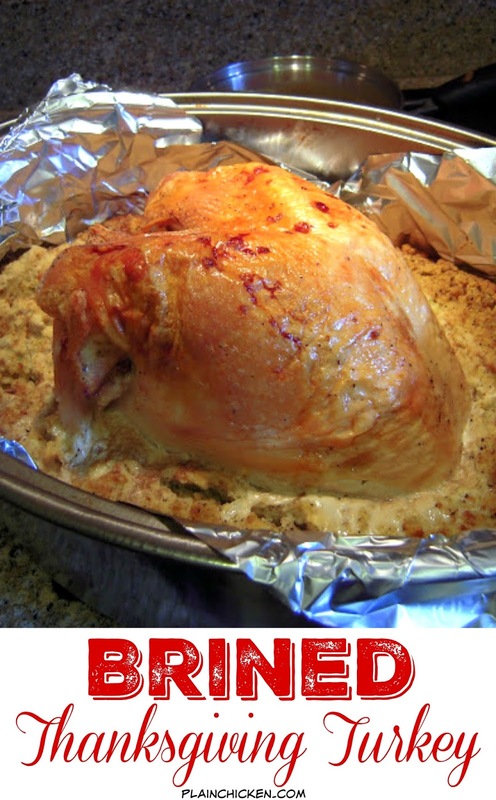 I hope you will take the plunge and give this brined turkey a try this year! In a large stockpot over medium-high heat, combine vegetable stock, salt, brown sugar, peppercorns, and juniper berries. Bring to a boil, stirring occasionally. Remove from heat and cool. Add iced water to brine and stir. Pour brine over thawed turkey, breast side down. (We used a gigantic ziplock bag.) Make sure turkey is covered and refrigerate 10-16 hours. Remove the turkey from brine and rinse inside and out with cold water. Discard the brine. Place the turkey in roasting pan. Coat the skin liberally with vegetable oil. Roast the turkey at 350ºF until the internal temperature reaches 165 degrees. This is about 15 minutes per pound. Allow turkey to rest 10-15 minutes before carving. Ooh, Stephanie, I'm convinced I have to try a brined turkey now! Holy cow, I wish I could reach in a taste it! Beautiful pics. Makes me hungry! This is the way we prepare the turkey too. I agree it is more flavorful and very moist. I'm ready for turkey and all the sides. Cost Plus World Market has juniper berries. Elizabeth, I've bought them in a bottle. Seems like the brand was Spice Islands in the seasoning section. I have always wanted to try this. I think you may have just convinced me! I'm trying to decipher your picture. Did you brine only a turkey breast? I'd thought about doing just a breast. We've brined before, and you're exactly right on how good it is. I wouldn't mind brining and roasting just a couple of breasts and was wondering how it turned out for you...if indeed that's what the picture is. Is that dressing? Looks fantastic! We do it the same way with a whole turkey or bone-in turkey breast as you see above. We do stuff some dressing inside, but most of it is outside in the pan. Thanks! One other question, I'm guessing there are no pan drippings, as it would get soaked in the stuffing, that's how I make gravy. Do you have a good gravy recipe? I didn't see one on your blog! (And by the way, LOVE your blog! 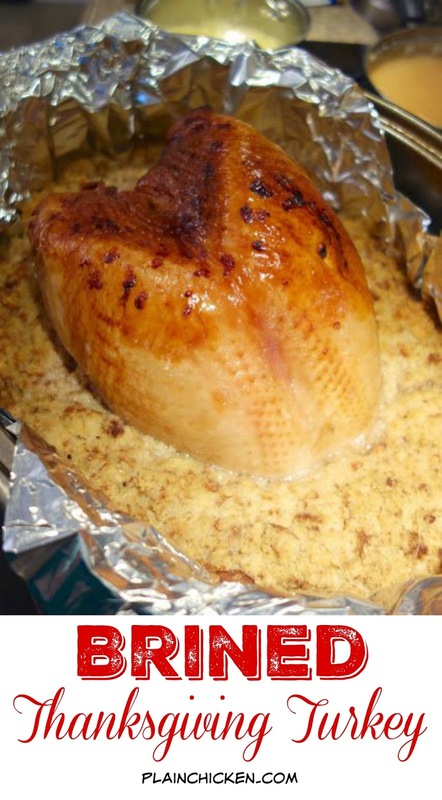 My husband always cooks the turkey for Thanksgiving and Christmas for my family, he has been using the brined method for years, just love it!! My Mom asked a should she make the turkey this Thanksgiving and I was like mmmm.... no that's okay, it's kinda Dave's thing! Brining really is the best way! Quinn is in charge of the turkey, and he's a big believer in brining, too. It makes such a difference! How big was the breast of turkey since you said it fit into a really large bag. I presume it was a jumbo plastic bag. What kind of bag would you put a whole turkey in? Thank you. I double bag the turkey roasting bags for the brine. Basically, I line a large stockpot with them, place the turkey and brine inside, and tie them up. They're not heavy duty enough to hold the weight of the turkey all by themselves though, so the large stockpot is key. I have been considering this for a while. My only problem is that I am allergic to juniper berries - I can't drink gin because my tongue & throat swells up. Are the juniper berries necessary for the taste or is there a substitute? I just substitute vodka for gin in drinks, but I don't think I want a drunken turkey...lol. You could leave them out. Basic brine 2 cups kosher salt 1 cup sugar 1-2 gal. Water. Heat and stir. Cool pour over Turkey in bag and let sit overnite. I add apple juice or honey. You van add Rosemary .. add whatever spices you like. My brine this year. Orange Peel apple juice kosher salt sugar oranges. Yum!!! Sounds like a good brine recipe Steph - Sometimes one of the hard things for me is finding a turkey that is not already injected with brine. I was considering brining this year but I read the other day that you should only use a fresh turkey. It said that the frozen turkeys are already injected with salt to keep them fresh and they are too salty if you brine. Has anyone else found the frozen ones too salty after brining? Your blog is my absolute favorite. Thanks for all the wonderful recipes. Brining does not make meat salty. Moisture is drawn into the meat by to super moisten the meat. Salt helps to denature the protein fibers so that water (moisture) can be absorbed into and between the fibers so that the meat can lose moisture during cooking (always happens) and end up with more moisture after cooking. Brined meats actually weigh more than before brining. If I buy my turkey already pre-brined do I need to buy a heavier bird than if I were buying a non-brined bird? I have brined a frozen turkey in the past and it did get too salty. I used a packaged chicken broth for the brine, and it was just too much. I began making my own vegetable stock for the brine using a Whole Foods recipe. It has no salt in it, and I find the brined frozen turkey was not overly salty using this method. 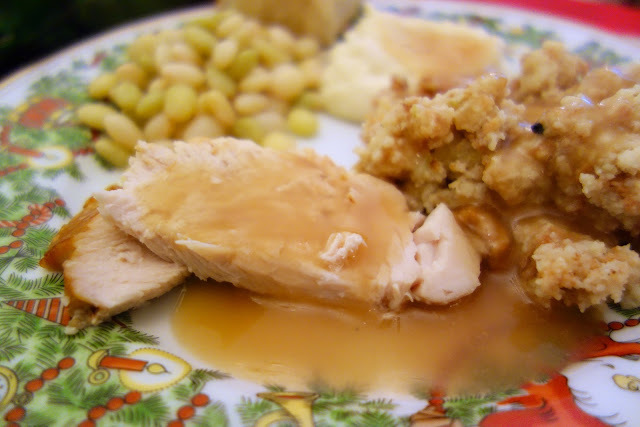 I have been brining my turkey for several years and would not cook a turkey any other way!! I used to use Alton Brown's recipie from Food Network, but last year I bought a brine mix from Cost Plus World Market and it was just as good. And I have always bought a forzen turkey and have no problems with saltiness!! Thanks so much for your input. I'm going to try it this year. One quick question, I am not a cook but feel intrigued to try this. It say "Remove from heat and cool. Add iced water to brine and stir" Ok, here is my question. Is it cool then add ice water, or cool with ice water? Just want to clarify before I try. Thank You. I always brine but cover the breast with bacon before cooking.would like to try flattened. Kathy Salido is the brine you buy do you need to still add stock and all the other ing.? i'm like a really new cook and have know idea how to brine except have seen the brine mix in stores a lot lately would like to try as my husband just got back from Iran and this is our first big holiday together. I have wanted to brine my turkey for years, but never have tried. I guess the biggest reason for not trying it yet is the fact I always cook 24lb birds. LOL My fridge is always so full of all the other foods for the holiday that I can't even think of fitting a large enough container in there as well to brine that big of a bird. * what kind of vegetable stock did you use, or did you make your own and if purchased, do you know of anyplace to buy larger sized containers of the stock? I've never seen any other than the boxes in the store and for some reason the veggie stock is more expensive than the other types. * what bag did you use/find to allow the entire bird to fit inside? I know there are those huge bags for storage etc. but think those aren't sold for food, although I could be wrong. Thanks for posting this. I think this might be the year I breakdown and try it myself. I used store-bought vegetable stock. I believe it was College Inn brand, but any brand should be good. I used a 2 gallon ziplock back for the bone-in turkey breast and it was perfect. I hope you give it a try. This is the first turkey that I enjoyed - so juicy and flavorful. Great. Thanks Stephanie. I am considering it this year. I am working on an order from Penzeys Spices today anyway so I've added Juniper berries to my list already just in case. The 2 gallon bags must be huge to fit a turkey in there along with that much liquid. wow. Thank you again for the info. I've tried many different ways to cook the turkey over the years. Honestly, I haven't cooked a turkey in the oven now for about 15 years. Ever since I used my Nesco the first time to cook my turkey I've never used an oven since. Plus, the bonus is I have my entire oven available for lots of other goodies. If you haven't cooked one in a Nesco before Stephanie, you really need to. My turkeys have always been super moist, but any extra help can't help. I've cooked them a number of years upside down so all the juices run through and into the breast even rather than away from it and that works really well. Not so much a pretty bird you want to put on the table if you like to do that but, it really made a difference. We put the turkey in the bag and adde the liquid until it was full. We had a little liquid leftover. Hope you enjoy it! Brining my turkey for the first time this year! I have a question...what in the heck are juniper berries? Are they a must for this recipe? Juniper berries are an herb that is the base for gin. The only essential ingredients to a brine are the water/stock, sugar and salt. you put the stuffing in the pan from the beginning. It will cook the entire time with the turkey. If it starts to get too brown on top, lay some strips of foil on it mid-way through the cooking time. You can add any seasonings to the basic brine of salt and sugar. I had oranges and Peel apple juice salt sugar honey. Yiy was amazing!!! We always brine our pork chops and chicken. It's such a game changer! I was using a basic brine recipe that also called for juniper berries. They probably make it taste even better. Maybe one day I'll remember to buy some.